A private key is a string of data that allows you to access the tokens in a specific wallet. They act as passwords that are kept hidden from anyone but the owner of the address. An unpredictable (typically large and random) number is used to begin generation of an acceptable pair of keys suitable for use by an asymmetric key algorithm. 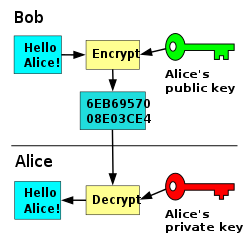 In an asymmetric key encryption scheme, anyone can encrypt messages using the public key, but only the holder of the paired private key can decrypt. Security depends on the secrecy of the private key. 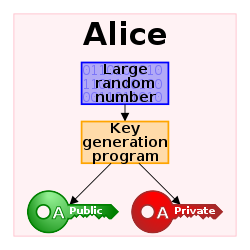 In the Diffie–Hellman key exchange scheme, each party generates a public/private key pair and distributes the public key. 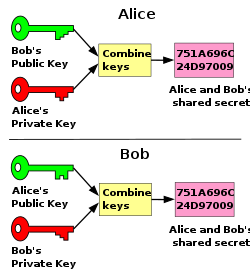 After obtaining an authentic copy of each other's public keys, Alice and Bob can compute a shared secret offline. The shared secret can be used, for instance, as the key for a symmetric cipher. Public key cryptography, or asymmetrical cryptography, is any cryptographic system that uses pairs of keys: public keys which may be disseminated widely, and private keys which are known only to the owner. This accomplishes two functions: authentication, which is when the public key is used to verify that a holder of the paired private key sent the message, and encryption, whereby only the holder of the paired private key can decrypt the message encrypted with the public key. In a public key encryption system, any person can encrypt a message using the public key of the receiver, but such a message can be decrypted only with the receiver's private key. For this to work it must be computationally easy for a user to generate a public and private key-pair to be used for encryption and decryption. The strength of a public key cryptography system relies on the degree of difficulty (computational impracticality) for a properly generated private key to be determined from its corresponding public key. Security then depends only on keeping the private key private, and the public key may be published without compromising security. Public key cryptography systems often rely on cryptographic algorithms based on mathematical problems that currently admit no efficient solution — particularly those inherent in certain integer factorization, discrete logarithm, and elliptic curve relationships. Public key algorithms, unlike symmetric key algorithms, do not require a secure channel for the initial exchange of one (or more) secret keys between the parties. Because of the computational complexity of asymmetric encryption, it is usually used only for small blocks of data, typically the transfer of a symmetric encryption key (e.g. a session key). This symmetric key is then used to encrypt the rest of the potentially long message sequence. The symmetric encryption/decryption is based on simpler algorithms and is much faster. In a public key signature system, a person can combine a message with a private key to create a short digital signature on the message. Anyone with the corresponding public key can combine a message, a putative digital signature on it, and the known public key to verify whether the signature was valid—made by the owner of the corresponding private key. Changing the message, even replacing a single letter, will cause verification to fail: in a secure signature system, it is computationally infeasible for anyone who does not know the private key to deduce it from the public key or from any number of signatures, or to find a valid signature on any message for which a signature has not hitherto been seen. Thus the authenticity of a message can be demonstrated by the signature, provided the owner of the private key keeps the private key secret. Public key algorithms are fundamental security ingredients in cryptosystems, applications and protocols. They underpin various Internet standards, such as Transport Layer Security (TLS), S/MIME, PGP, and GPG. Some public key algorithms provide key distribution and secrecy (e.g., Diffie–Hellman key exchange), some provide digital signatures (e.g., Digital Signature Algorithm), and some provide both (e.g., RSA). Public key cryptography finds application in, among others, the information technology security discipline, information security. Information security (IS) is concerned with all aspects of protecting electronic information assets against security threats. Public key cryptography is used as a method of assuring the confidentiality, authenticity and non-repudiability of electronic communications and data storage.